An artist that references the Australian landscape in her dimensional painted works. They are highly colourful and look almost like quilts, and so are quite relevant for my proposed Australian outback Ebb and Flow quilt. I have moved away from my initial idea of circles to squares but I am drawn to circles like these and have used them previously. In this she references aboriginal dot painting to some extent which I alway find a bit fraught. I guess you are unlikely to inadvertently use aboriginal symbols that belong to the songlines of a specific indigenous group, but I still feel it’s difficult to distinguish yourself from indigenous art. Whilst appropriation is considered legitimate, it may be considered inappropriate to appropriate from indigenous works. This is my first textile work and it was heavily worked in layers, partly because I kept not being happy with what I had done and wanting to add more to improve it. This is in part how I work and it’s not all bad because sometimes it can result in more complex works and with unexpected results. And you know how I like unexpected results. I am excited every day to see how works turn out and if I knew that all in advance it would lose the thrill for me. 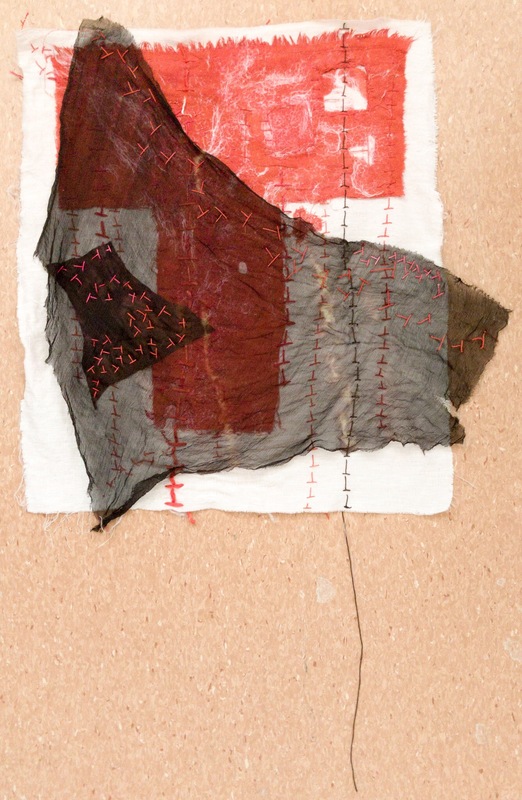 The idea here was to take the graphic qualities of the T shape evident in the red collage and interpret this in cloth melded together with stitch and manipulation into a single work. I tried to use Joomchi principles to meld the red cloth together and then on to the backing cloth but it really is of limited success in cloth. Even using silk fibre between the layers didn’t help much and I finally resorted to needle felting the fibre through to help bind the layer together. Once I had this done I then stitched in fairly regimented lines of T shape stitch. It all looked a bit sterile and flat so I added contrast in shape and colour by draping a piece of scrap of a random shape on top. I thought the shape looked a bit like another organic T so I went with that and moulded it a bit more to reference this. Then some red stitching on top to have some clear stitching to appreciate amongst the jumble of stitching on this work. In my red collage I get the sense of the T shape falling or tumbling randomly and I have tried to translate this into the red stitching on the surface of this work. This second work went through a number of translations before it ended up like this. My idea was to highlight embossing in the preparation of this textile for stitch. I tried to do this by using padding (a disposable towel from work) and cutting in to this and then stitching in the depression. Originally all three motifs here where still part of the one layered towel but I wasn’t happy with the look or configuration so I choose to cut out the partial stitched motifs and re arrange them on a red background. Now I had the chance to highlight the raised nature of the individual sections by stitching along the background and then up on to the white sections. I have also tried to reference embossing with the raised couched stitching enclosing ribbon or thick thread under stitch. Each individual little stitch work references things in my drawings. The red net appearance of the top layer of the red collage, the woven appearance set into the embossing and the small red squares themselves in the red square embossed drawing. The disposable towel I used is a bit thick and tough and not exactly as malleable as I would need to highlight embossing. I was quite pleased with the raised couched ribbon and the running stitch but again I could have spent more time working the thing into more of a unified whole. My final textile work is my favourite. There is a more minimal approach to stitch and more focus on the luscious fabric. It is a piece of hand dyed silk organza that has not been manipulated other than to be dyed in my now signature red for this series. 😀. I am happy with the linear marks bound at the top and free at the bottom reminiscent of my partial joomchi stitched paper work. 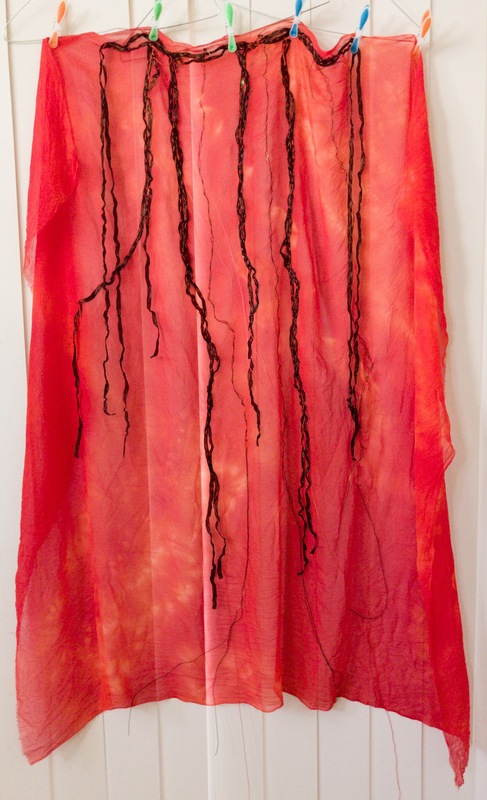 I intended this work to be hung as shown to highlight the drape and fall of both the fabric and the line. The silk thread stitching has been worked twice in reference to the twice drawn line in a kimono drawing and its translation in to stitch on paper. I was pleased with the way you can see both the front and back of the stitch through the thin organza giving the line a more continuous quality. I think this is the strongest of the three in highlighting drape and interesting line quality. Plus I’ll be able to repurpose it as a scarf later.